On May 7, 2019 Licking Heights residents will have the opportunity to vote on a substitute levy. Our Board of Education has taken advantage of a relatively new ballot option for Ohio school districts by placing a “substitute” levy on the May 7, 2019 ballot. This levy will not increase existing property tax payments because it would effectively substitute two existing “emergency” levies that will expire in 2021 and 2023. Within the last ten years, our enrollment has surged from 3,000 students to more than 4,500 - a growth rate of 51 percent. 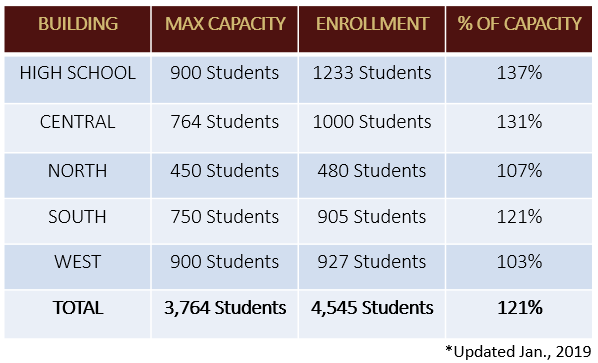 The enrollment growth is expected to continue, with conservative estimates showing our student population increasing to over 6,000 by 2029.